Polymer deposited on the fine features of plant surfaces produces high surface-area films for supercapacitors. Under a microscope, the surfaces of many flower petals and plant leaves look like a landscape of bumps and pillars. The tiny structures make water droplets bead up and roll off. They also dramatically increase surface area. By depositing a thin polymer film directly onto these high-area surfaces, researchers have made electrodes that can store a large amount of charge (ACS Appl. Mater. Interfaces 2018, DOI: 10.1021/acsami.8b12551). The electrodes could be used for light, flexible supercapacitors that power wearable gadgets and tiny sensors. Like batteries, supercapacitors are energy-storing devices made of two electrodes and an electrolyte. But they charge and discharge much faster, providing short bursts of power in vehicles, power tools, and consumer electronics. Conventional supercapacitor electrodes are made of carbon or metal oxides, whereas newer, flexible ones use graphene or conductive polymer electrodes. One way to increase the charge storage capacity of these devices is to increase the surface area of the electrodes. Researchers have done that before by making conductive films on three-dimensional scaffolds with microscopic features. But the scaffolds have been made using expensive lithography techniques. “So we thought we’d start with nature,” says Trisha L. Andrew, a chemist and materials engineer at the University of Massachusetts, Amherst. She and her colleague Lushuai Zhang used petals and leaves as scaffolds to make microstructured polymer films. They used a method that Andrew has developed and used to make solar cells on cloth. It involves injecting thin vapor streams of a monomer and an oxidant perpendicular to each other into a reaction chamber. Where the two vapors intersect, they react and form a polymer that deposits on the substrate placed underneath. The researchers use 3,4-ethylenedioxythiophene as the monomer and iron trichloride as the oxidant, which react to form a porous polymer, poly(3,4-ethylenedioxythiophene), that can store charge. The duo made 10-µm-thick films on fresh sunflower petals and pressed pansy petals, and also on the dried leaves of lotus plants and fresh leaves of two common household plants: zebra plant (Calathea zebrina) and friendship plant (Pilea involucrata). Lotus leaves are covered with arrays of microscopic pillars; sunflower and pansy petals contain pyramidal structures; and the two houseplant leaves are textured with an assortment of features of different sizes. “Every petal and leaf has various structures exactly on the scale we were looking for, which is a few micrometers,” Andrew says. Next, the researchers tested supercapacitors made using the microstructured films as electrodes. 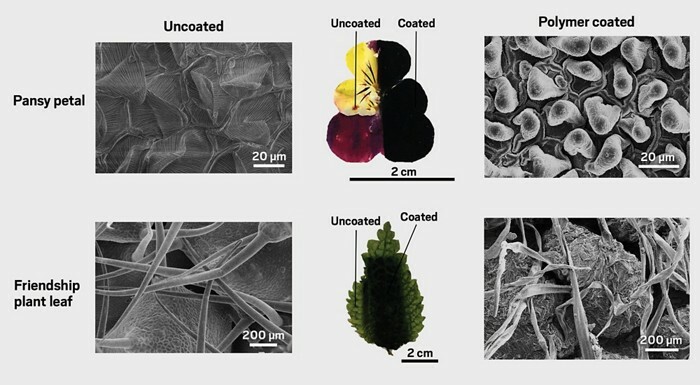 The high density of large surface features on friendship plant leaves resulted in the highest surface-area films, which led to the highest specific capacity of all of the materials tested of 142 mF/cm2. That’s eight- to 10-fold higher than the best supercapacitor electrodes, which are made of laser-scribed graphene and have capacitance of 4 to 5 mF/cm2. The devices are robust, showing no physical degradation or loss in capacitance after 10,000 charge-discharge cycles and after being bent and rolled a few hundred times. Laminating the devices in plastic keeps them from breaking down, the researchers found. “I believe this technique can be scaled up and that we can use plant matter in commercial devices,” Andrew says. The use of natural materials and cheap polymers should make them low cost. Chinedum Osuji, a chemical and biomolecular engineer at the University of Pennsylvania, says that the reactive vapor deposition technology Andrew uses leads to thicker textured polymer films than ones made so far, which also adds to the charge-storing capacity. Plus, the method works under mild conditions. “This is attractive from the perspective of low-cost, facile fabrication of electrochemical energy-storage devices,” he says.